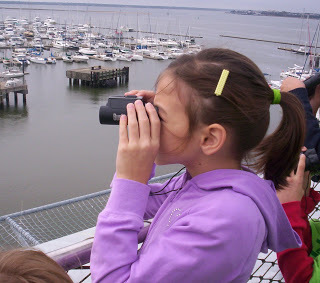 Friday brought another field trip opportunity, this time with my third grader. 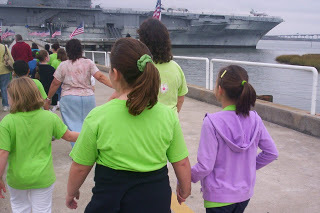 We listened to a local history lesson, learned about plankton and other miniature sea life, toured an aircraft carrier, and got to walk through a submarine. Actually, the group of kids I was with wanted to go through the submarine a second time, so we did. 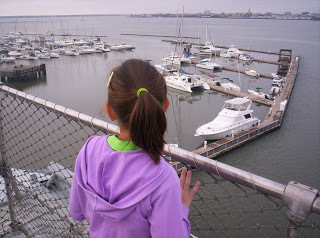 With all there was to experience, I enjoyed this field trip as much as my daughter did! Besides spending time with my daughter, I also like going on field trips because it allows me to get better acquainted with her classmates. As my daughters get older, there are fewer chances to interact with their school classes and I want her friends to know me as her mom while I also want to learn about them. Another benefit is to see how my daughter interacts with this group of children that she spends so many hours with each day. There were six children in my group on Friday and they were very well-behaved. As I ate lunch with my daughter and four other girls, they seemed happy to talk with me and answer my questions as I found out about the things that interest them. The benefits of spending the day with my daughter, her classmates, their teacher and other parents were many!